The ball dropped and the clock chimed 12 times to usher in a new year on January 1. For the Michigan Wrestling Organization, 2019 will be a landmark year as the promotion celebrates its 25th year of operation. After closing out a controversial and chaotic 2018, the new year will provide unprecedented opportunities for new main event stars to develop and lead the charge for a new era for the MWO. Gazing into the crystal ball, we may get a glimpse of what lies ahead for the biggest names in the organization, some of which may at a glance seem like an outlandish thought, but are they really? If the MWO is truly going to shake things up, then some drastic measures must be taken. So here are some bold predictions for the Michigan Wrestling Organization in what could be a huge year for the promotion as it embarks on its 25th year. Old School Ric Caurdiea is entering 2019 as the Michigan Wrestling Organization Champion, having ended last year with a title defense against the Superstar Alex Crow at Christmas Clash. And in a match designed to end the long-running feud between Caurdiea and Crow, the intensity of their rivalry was kicked up a notch with the recent formation of Crow’s Scum of the Earth group and Hoss Fight’s alliance to “Old School.” But the Superstar isn’t the only challenge gunning for Caurdiea’s title. There are severall superstars are looking to break into the top tier of the roster and become a major player in the MWO Championship title division. Coming off a tag title run, Jack Teryn of the Disciples of Darkness is poised to make a splash on his own, as is former MWO Great Lakes champion Bam Grizzlee, and Victor Cross, and former champion Creature Feature John Campbell. But perhaps the most dangerous of the contenders is Jeremiah J. Hughes, who is currently carrying a guaranteed MWO Title shot contract that he can use at any time he chooses. And with Jordan J. Scavone calling the shots for Hughes and reigning Great Lakes champion Roberto Cruz, there’s no telling what kind of havoc these three can cause in the MWO. The tag team division of the Michigan Wrestling Organization is really been a focal point of the live events. With the recent arrival of The Commission combined with established tandems such as Hoss Fight, the Steele Twins, the Dean Boys, the reign of current MWO Tag Team champions THEE Cody Leedy & Blackwell is in big trouble. Depending on how the ratings line up, the champs would be favored to retain the belts in matches against the Steeles and the Deans, but will have more concerns in matches against Hoss Fight and The Commission. But the one thing that is a constant is that the determination of work ethic of both of the sibling squads has resulted in great success for both teams. Despite giving up size and power to most of their opponents, the Steele Twins and the Dean Boys are always considered top contenders. However, given the competitive nature of the tandems, a feud between the Steeles and the Deans is not out of the question. What started out as potentially the most dominant faction in the MWO in the last five years enters 2019 as a shell of its former self. The Disciples of Darkness—headed by Skullz and managed by Tragedy Ann and Aksel James Geer—boasted an impressive roster that targeted some of the biggest names of the MWO. 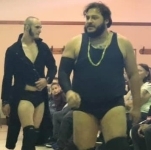 Coming into the New Year, only Skullz and Jack Teryn are the only current members of the group, with the defections of Victor Cross, Tyson Dean, and Pure Fury Jeff Clouse. Tragedy Ann and Geer are going to have to recruit some big talent to keep the group’s cause moving forward. Before his induction into Scum of the Earth, newcomer Corey Kerr was thought to be a possible option for the Disciples. Perhaps the next members of the group are already in the MWO, but they’re not looked at by the masses as possible members of the faction. An invitation from the faction would do a lot to create a lot of attention for superstars like the Creature Feature John Campbell and X-Convict, despite the fact that both former MWO Champions have been in a major rivalry with members of the group. And what if Tyson Dean was able to convince his brother, Tyler, that life under the dark umbrella of the Disciples wasn’t all that bad? During his time in the group, Tyson found himself in high-profile matches against main event-level talent. Not a bad way to spend a few weekends a month. There is some bad blood that is spilling over from 2018 that will take center stage in the early months of 2019. MWO Champion Ric Caurdiea and Hoss Fight’s vendetta with Scum of the Earth is long from over. There’s still a lot of unfinished business between former tag team partners Victor Cross and Jack Teryn. These two heavyweight powerhouses are poised to collide sooner rather than later. Pure Fury Jeff Clouse is in the crosshairs of the Disciples of Darkness following his unceremonious time as a member of the group and subsequent loss of the MWO Tag Team championship. And even though they’re no strangers to one another, the feud with Disciples leader Skullz and X-Convict shows no signs of letting up any time soon. It’s not out of the question to see PF and X-Convict join forces against the Disciples of Darkness. As alluded to earlier, a tag team rivalry between the Dean Boys and the Steele Twins seems like a real possibility, especially as both teams are looking to move up the ladder. With Roberto Cruz sitting atop the MWO Great Lakes title division, he seems to be the target of former champion Bam Grizzlee. Both Cruz and Bam are on the brink of a major explosion and the Great Lakes title may only prove to be a launching pad for the two superstars. But the one feud that could really help shape the middle months of 2019 that really no one is talking about is the inevitable showdown between Valor Society partners Loco and DJ Edwards. Loco has shown his alliance to Alex Crow’s Scum of the Earth group, a move that has been condemned on social media by Edwards. The Valor Society has been one of the MWO’s great tag teams, but their travels together seem to have come to a crossroads. History has shown that there is no love loss between the two authority figures in the Michigan Wrestling Organization. For the last several years, there has been a continued rivalry of sorts between MWO chief executive official Jason “the Basher” Clouse and MWO Commissioner Jessica Monroe. This will likely cause a major issue in live events with both of them wielding their power, probably often at the expense of the MWO superstars. If Clouse and Monroe were able to actually find common ground and work together to guide the company upward, they would be the most powerful team in the promotion. If not, the entire landscape of the organization will suffer for it. There’s no telling how many superstars will land in the Michigan Wrestling Organization this year. But of the wrestlers that currently make up the roster, there are several stars who are on the brink of a career-defining moment that will catapult them into the headlines as well as championship opportunities. Leading that charge is Roberto Cruz, who ended 2018 with his first championship win by defeating Jacob Brawn to capture the Great Lakes title. Right on Cruz’s heels is his stablemate, Jeremiah J. Hughes, who holds a title shot contract in his back pocket for whenever he chooses to use it. One superstar who is tired of being looked over is Codename Omega. As one of the strongest wrestlers in the organization, Omega should be a constant contender to any of the three solo sanctioned championships. Corey Kerr has all the tools to make a huge impact, as does popular tag team newcomers The Commission. In fact, Kerr and The Commission have scheduled title matches at the MWO Wrestling Live event on January 13. Besides the top two official authority positions in the MWO, who will wield the most power? There are a few brilliant people who can, given the platform and opportunity, become a major power broker both in the live events as well as behind the scenes. Since the disbanding of The Uprising, Simon Paige has had a lot of time plotting his next move. He guided Hall of Famer Real Deal Michael Reaver to the MWO Television title and has now been filling in at the broadcast table providing color commentary. Managing Reaver and other top-name talent, Paige has had many dealings with the Board of Officials as well as the current CEO of the MWO. Two other managers—Col. LawDog and Jordan J. Scavone—are both planning courses of action to catapult their charges to the next level. Scavone, the ex-commentator, also has experience with meetings with officials. LawDog, with his extensive military background before joining the ranks of professional wrestling, welcomes a new challenge in trying to impose his vision and plan for Codename Omega. Included in the conversation has to be Disciples of Darkness managers Tragedy Ann and Aksel James Geer. Together, they could be a major threat to any sort of control throughout the MWO. Another individual who has a lot of power in his own right—that within the confines of a wrestling ring—is senior referee Orville Hughson. Approaching nearly a decade of service in the MWO, Hughson has seen a lot in his career here. If anyone has advantages in just about every aspect of controlling the organization, it’s Orville, who may very well be the most dangerous man in the MWO. Are The Commission bound to win tag team gold in the MWO? How long will Ric Caurdiea rule as MWO Champion? Is this the year Bam Grizzlee breaks into the main event scene? Michael Reaver will retain the MWO Television title throughout 2019.